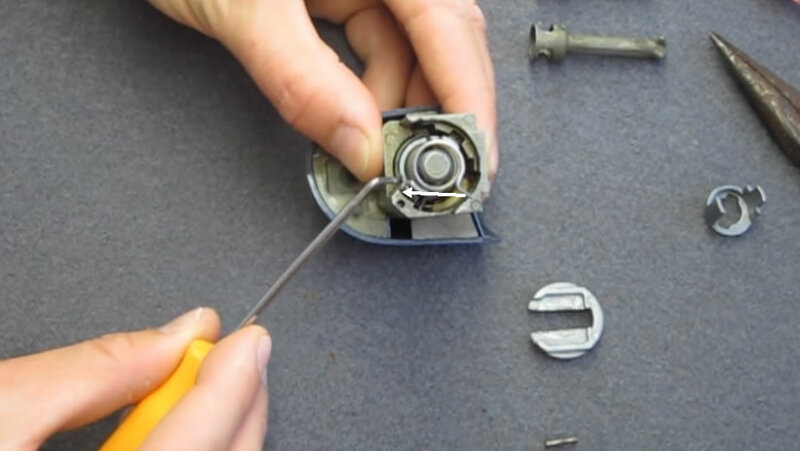 If your BMW E46 door lock is broken, then this post will show you how to repair BMW e46 door lock. This also works for the X5 and the X3. 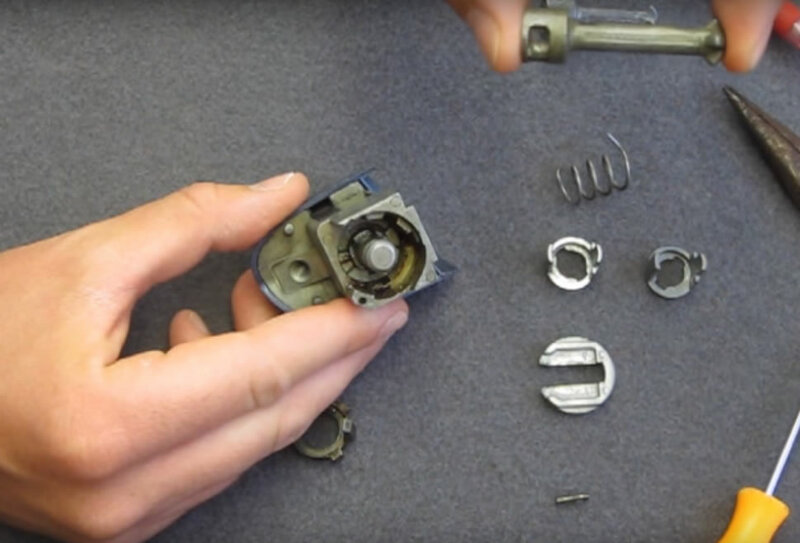 The only difference between the two locks is this piece is for the E46 3 Series and this piece slightly smaller for the X5 and the X3. 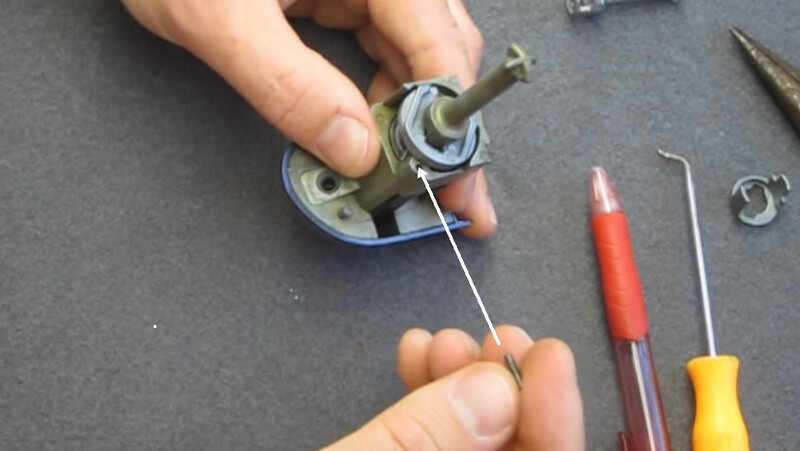 Here is your lock tumbler: First you want to make sure that the inner parts are aligned like this. 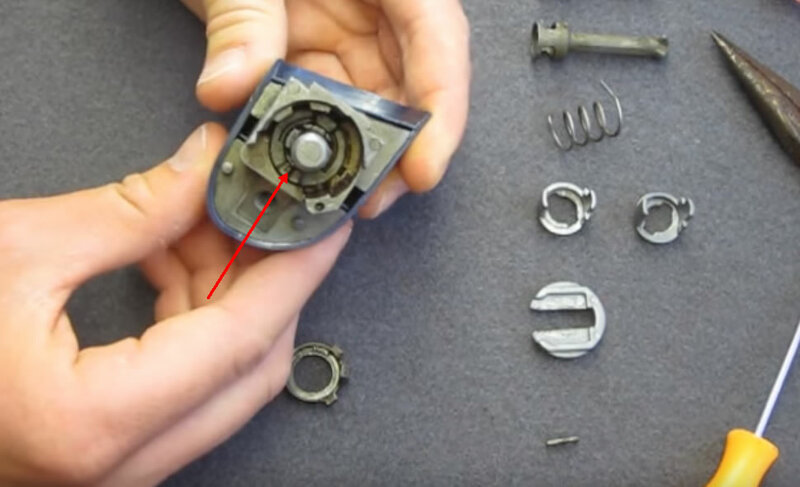 You can adjust that with the key if they’re not like that just turn the key a little bit and get the inner parts like that. Now the first piece you want to put in is your base plate and it fits perfectly in like this in these three grooves. 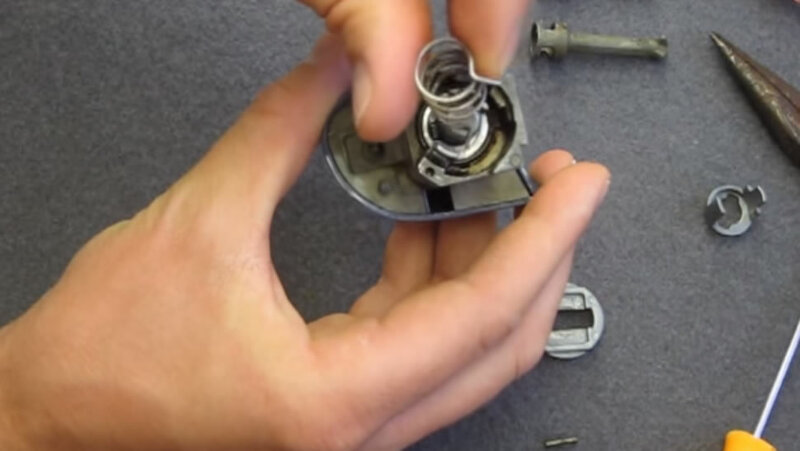 Make sure that’s flushed to there if not turn your key a little bit and get it to fit properly. The next piece you’re going to put in is this. This is for left hand drive vehicles most of you in the United States and Canada are going to use this piece and this is also the piece that’s most likely going to be broken. You’re going to put this piece in just like this push it down make sure it’s flush. The best thing to use is maybe a tool like this, a pen or what I’m using is this hollowed-out ballpoint pen. You’re going to do it just like this be careful because the spring will be under a lot of tension there. 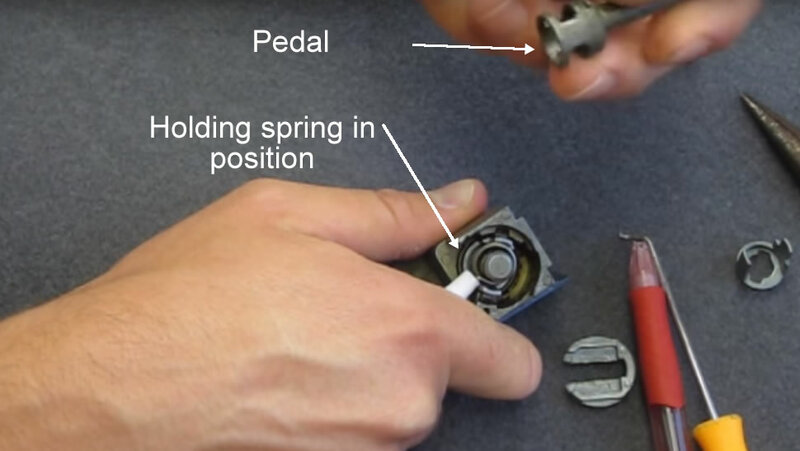 Once you have that spring compressed like that you grab your pedal and you’re going to put it on just like this. Just keep it pushed down and then you’re going to want to grab your lock piece. Now that you have that down maybe get a better angle. Make sure that’s pushed down as far as you can. Then you’re going to grab this piece and you’re going to slide it on gently. 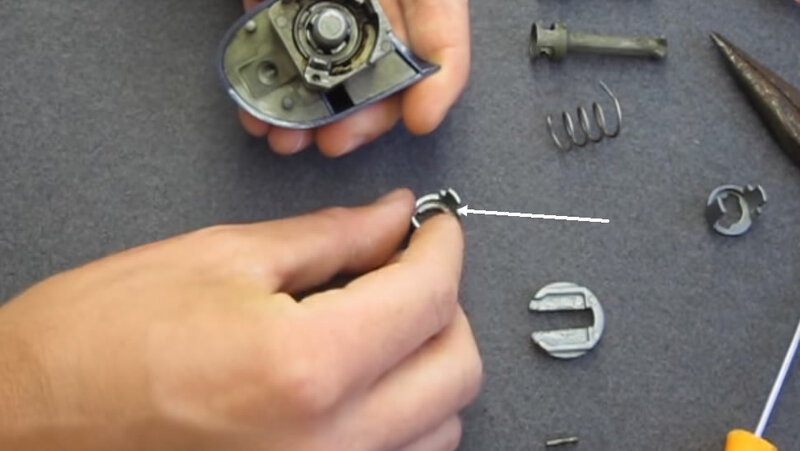 If it’s not sliding on then, you don’t have your spring compressed enough. This should slide on relatively easily. This piece slid in and holding everything into place now. The last thing you have to do is grab your pin. If you’re missing your pin you’re going to have to find something else to fashion a pin out of. You could use a piece of wire. 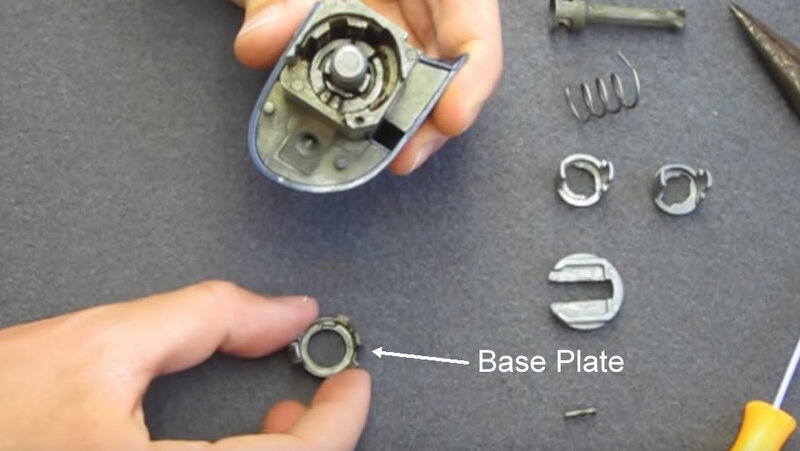 Take a look in your toolbox you might be able to find something because this is really important this holds the u-shaped piece onto your tumbler which holds everything into place. Push that in, give it a little tap. Just to make sure you did it right put your key in and everything should turn. 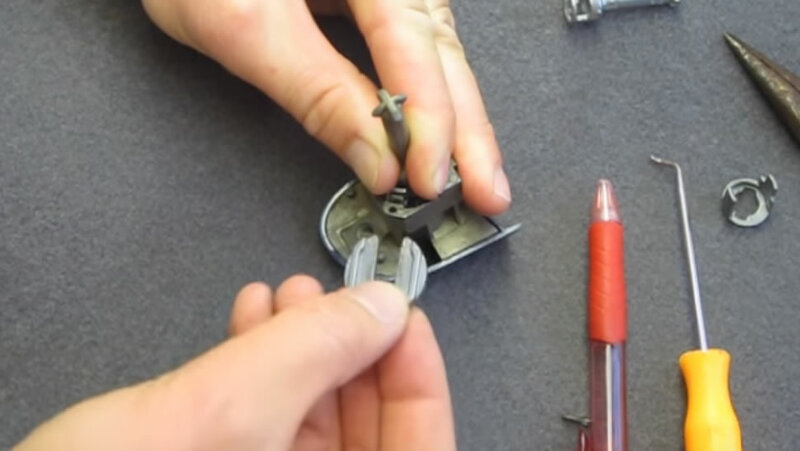 Keep in mind also when you do this you want to make sure you grease all these moving parts in here so you can do it afterwards. You can put grease in there or you can do it during it. 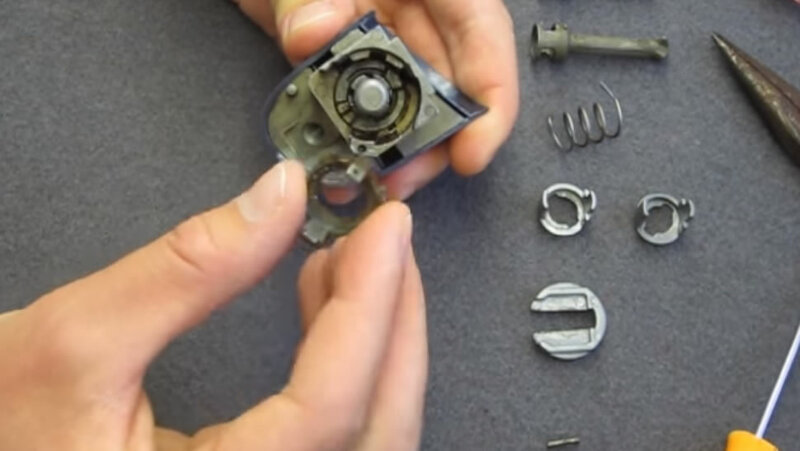 But as you’re rebuilding it with grease everywhere, parts get slippery and it makes it a lot more difficult so you might want to do it afterwards. It’s really important to do that or else your lock will break again so there you go I hope that helped you out!